Elvis At Stax: Deluxe Edition’ 3CD Box Set To Be Released August 6th! The last major studio sessions in the career of Elvis Presley have finally been gathered together for the first time in one comprehensive package as ELVIS AT STAX: DELUXE EDITION. The deluxe 3-CD box set, a 40th anniversary chronicle of a dozen nights that Presley spent at Stax Recording Studios in his hometown of Memphis in July and December 1973, will be available everywhere August 6, 2013 through RCA/Legacy, a division of SONY MUSIC ENTERTAINMENT. The box set arrives in stores ten days before the anniversary of Presley’s death on August 16, 1977. “I Got A Feelin’ In My Body” (recorded at Stax, catalog RCA PB-11679), was reissued as a posthumous single by RCA Records in 1979. Jørgensen has long been concerned with doing justice to the Stax sessions, which were never acknowledged by the artist’s record label RCA as a unified whole. Instead, as with most of Presley’s studio work in his second decade as a recording artist, the tracks were scattered onto LPs and intermingled with material recorded in Nashville and Hollywood. The bulk of the Stax cuts showed up on Raised On Rock/For Ol’ Times Sake (1973), Good Times (1974), and Promised Land (1975). For ELVIS AT STAX, many of the outtakes originated on the CD-era reissues of those three albums on Jørgensen’s and co-director Roger Semon’s own label, Follow That Dream (FTD) Records. 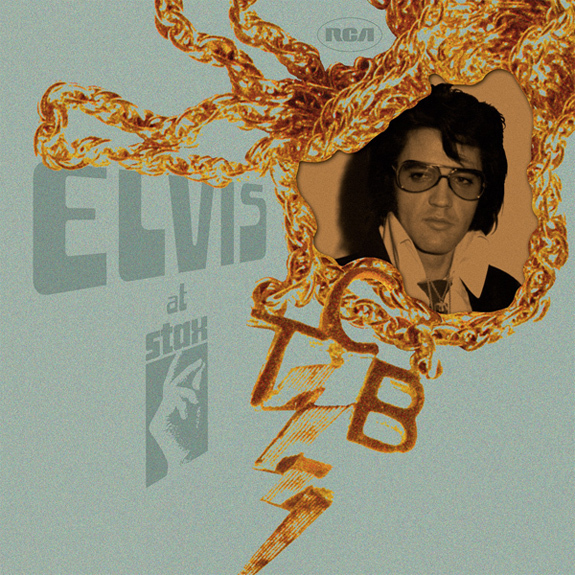 ELVIS AT STAX was produced by Jørgensen, Semon, and Rob Santos of Legacy A&R. Taking up the cause for ELVIS AT STAX is another scholar and aficionado of the artist, award-winning resident Memphis journalist Robert Gordon, who has written an in-depth, day-by-day (i.e. night-by-night) liner notes essay for the box set. Previously, Gordon and his wife Tara McAdams (author of The Elvis Handbook, 2004) co-wrote the liner notes essay for RCA/Legacy’s From Elvis In Memphis: Legacy Edition (2009). In addition to major biographies of Muddy Waters and Jerry Lee Lewis, Gordon is the author of two important Elvis Presley studies, The King on the Road: Elvis Live on Tour 1954 to 1977 (St. Martin’s, 1996) and The Elvis Treasures (Random House, 2002). Gordon has also written two books on the Memphis music scene, the acclaimed It Came from Memphis (Faber & Faber, 1995, foreword penned by Peter Guralnick) and the upcoming Respect Yourself: Stax Records and the Soul Explosion (Bloomsbury USA, set for publication in November 2013). Etched in music history, 1973 was a crucial watershed year for Presley, in the wake of his return to extended concert touring in 1972, after 12 years away from the stage and 27 movies in Hollywood. His New York City concert debut was emblematic of an exciting new chapter in his career. It was chronicled last year on the RCA/Legacy deluxe 2-CD+DVD box set, Prince From Another Planet: Elvis As Recorded Live At Madison Square Garden / 40th Anniversary Edition, which captured an afternoon and an evening concert staged on June 10, 1972. His manager, Colonel Tom Parker, sought a world-class mega-event to underscore the touring, which led to the one-hour global satellite broadcast from the Honolulu International Center Arena on January 14, 1973, viewed by over one billion people around the world. That, too, was recently chronicled on the RCA/Legacy double-disc set issued this past March, Aloha From Hawaii: Legacy Edition. The highs of 1972-’73 led Presley and Colonel Parker to accept RCA’s $5.4 million offer for an outright transfer of Presley’s complete back catalog. He wanted a new start, new control, and a new publishing company. But the RCA deal also called for his return to the studio and a promise for him to deliver 24 new masters, i.e. two new singles (four songs), a new pop LP (ten songs), and a new gospel LP (ten songs). Four years earlier, in 1969, Presley had made his Memphis recording return (after a 13-year absence) at Chips Moman’s American Studios. These triumphantly successful sessions had yielded a year-long string of ‘comeback’ hit singles: “In the Ghetto” (#3), “Suspicious Minds” (#1), “Don’t Cry Daddy” (#6), and “Kentucky Rain” (#16), the last such string of major consecutive hits in his life. But by 1973, American had closed up shop, and most of its musicians had relocated to Nashville. However, Stax Studios, the launching pad of such greats as Otis Redding, Wilson Pickett, Sam & Dave, Booker T. and The MGs, and Isaac Hayes was still thriving at its original 926 E. McLemore Avenue space. In fact, Isaac Hayes relinquished his studio time to accommodate Presley. Ironically, less than two years later in 1975, the Stax offices would also be closed.